For the other “big” waterfall, see our post on Iguazu Falls in Brazil. Our verdict on which falls is better is at end of this post. 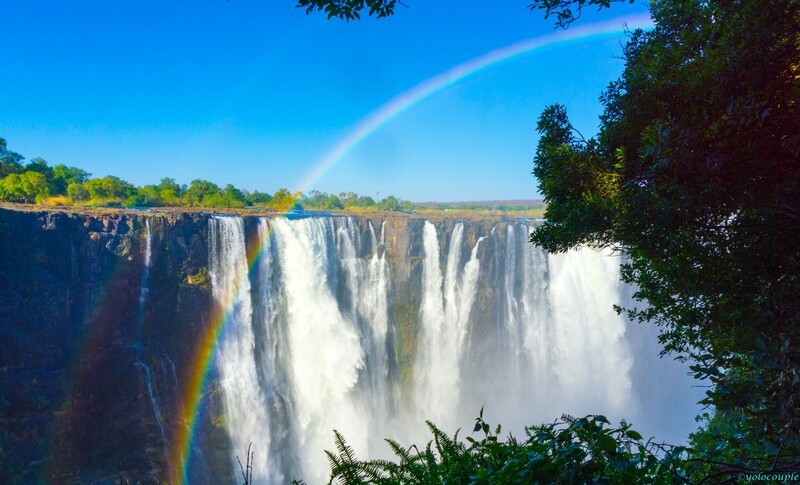 But a typical tour to South Africa and Victoria Falls can range from $3000 to $5000+ per person! This is expensive so we kind of put that plan on the back burner. Then out of nowhere, The Flight Deals showed a deal to get from Washington DC to Johannesburg for only $594 on South African Airways. Now I don’t know about you, but $600 to Africa is a great bargain, so we booked it! We’ll give you the full details on that trip in another post, this one will focus on how to see Victoria Falls. Sunset at the falls. Notice there is no water as this was near the end of the falls during the dry season. During the wet season there should be water. Note: We went during the dry season, so there is a lot less water at Victoria Falls than usual. Victoria Falls is located on the border between Zimbabwe and Zambia. If you are visiting South Africa, don’t forget to include it on your itinerary. You can fly to either Victoria Falls, Zimbabwe (VFA) or to Livingstone, Zambia (LVI) airports from Johannesburg (JNB). There are daily flights with British Airways, and they run about $200-300 roundtrip from JNB. A great way to save is to use British Avios points (transfer from American Express rewards or Chase Ultimate Rewards) which only costs 8500 Avios points + $88 in fuel surcharge per person, which is what we did. The best views of the falls are from Zimbabwe side, so we chose to fly to VFA. Victoria Falls town is also closer to the actual falls than Livingstone. Many hotels in Victoria Falls town, you can walk to the falls itself. Livingstone is farther from the falls (about 5 km) so most hotels will require a taxi to get to the falls. However, Livingstone is a bigger city and more developed so there are more restaurants and hotel choices. You only need 1 day to see Victoria Falls, so we booked a hotel closest to the falls, the N1 Hotel. This hotel is literally, a 15 minute walk to the falls. The best part is, a room with double bed is only $50 per night. Compared to other hotels in the area which are farther and costs $100+ per night. The rooms are small, but clean. It’s good for a short 1 or 2 night stay. You can see most of the falls in half a day from Zimbabwe side. You can actually walk across a bridge into Zambia from Zimbabwe and see the falls from both sides, but this will take more time. 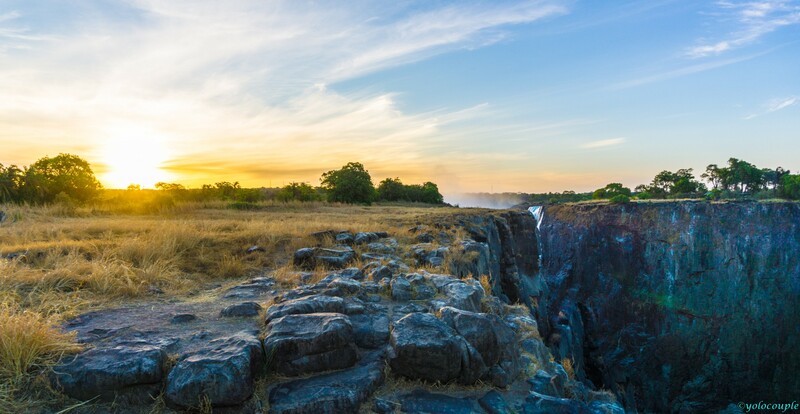 From the Zambia side, there is a place where you can swim in the water and be on the “edge” of the waterfall. However, you need a tour to do this activity, and it costs $100 per person. Visa – US Citizens can get a single entry visa on arrival for $30 at the airport in Zimbabwe. 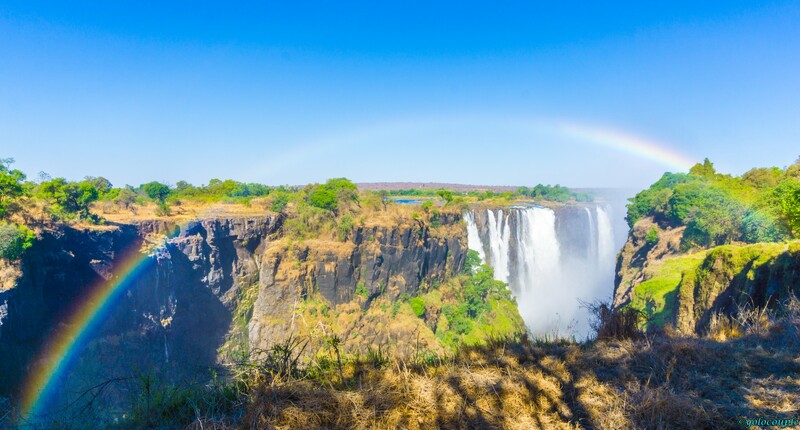 If you plan to visit Zambia to see the other side of the falls, you can get the Uni Visa which is $50 but allows unlimited entry to Zimbabwe and Zambia for 30 days. Currency and costs – Zimbabwe currency is the US dollars. For some reason, food and taxi costs are pretty expensive for a third world country. A dish at most restaurant is $12 – $16, so expect to pay about $20 per person for dinner. Taxi around town and to the falls is about $5 per ride. Taxi to and from airport is $30 per car, although you might be able to find some people who will do it for $20. Iguazu Falls vs Victoria Falls – which one is better? It’s really hard to say which fall is better than the other. We went to Victoria Falls during the dry season so there is not as much water, so it is not as impressive as it would have been during the rain reason. Each fall is also different in the way it is shaped. Vic Falls is one continuous fall that is wide and deep, while Iguazu Falls is more spread out and has multiple layers of water falling at different places. But, overall we do think that Iguazu Falls is better, as the falls consists of a lot of smaller falls, and has better viewpoints. Iguazu Falls also has platforms you can walk to get literally under the falls. So if we have to choose one over the other, we would have to go with Iguazu Falls. However, we do recommend you try to see both if you can, as each is a different experience. 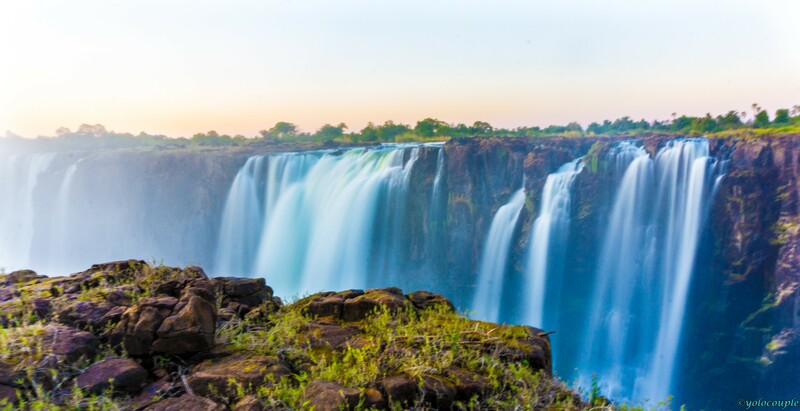 Pingback: Victoria Falls – How to see the Largest Waterfall in the World | Where's Mary? Did you check out the Zambian side at all? Thanks for visiting our blog Mary! You have a great blog too! We walked to the bridge between the two countries, and a bit into Zambia, but did not go in the park from the Zambia side. It was because we went during the dry season, and there was literally no water at all, so we didn’t bother to go much further. How is it on that side? It’s pretty great – you can go around to the top and get a lot closer. Zim is good because you can see more of it at once (and it has more water in dry season) but Zambia is better for getting closer. SW Companion Pass – Free Flights for Almost 2 Years!